The biggest challenge in getting new, additional, word of mouth referrals from others is that they don’t know what you actually do for work. The shock on my face was astounding. Thank goodness my contact was on the phone. I immediately replied that website design is exactly what my company does, and we’d be happy to assist him with his needs. I subsequently realized that his question was a result of a number of things. The primary reason he asked is that he wasn’t aware of what I did for a living. Which is just as much my fault. To solve this problem, I realized I needed to tell people what I do, but I never felt comfortable sharing directly what I do for a living unless I get asked. I’m not sure why I feel that way. It’s probably just a subconscious thing. Let me break it down for you! When you ask others questions, the overwhelming response is the answer followed by a question by them. Try it for yourself. Attend a networking event and ask someone what they do. Then listen. They will share with you what they do and they will almost always follow that with “and what do you do?” Now you have the opportunity to share with them what it is you do for work. 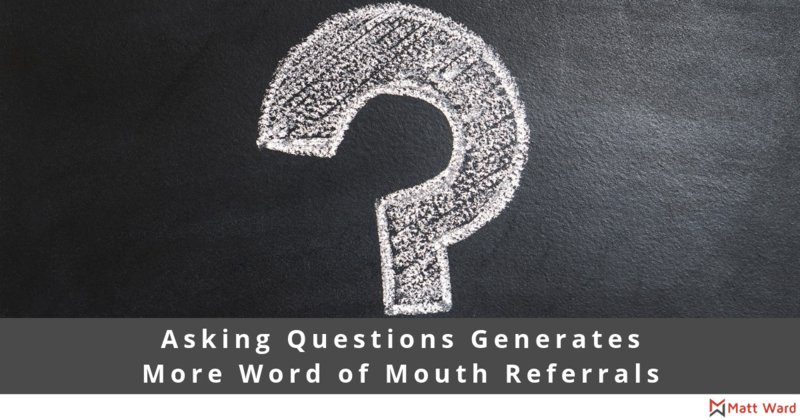 Asking questions allows you to probe deeper into someone, resulting in a much deeper connection, which bridges the gap, creates moments of caring, and results in more word of mouth referrals. Trust me…asking questions generates more word of mouth referrals.